Star Wars is coming! And in celebration of what we're lovingly calling 'Nerd Christmas' in my house, I've made these Star Wars Ewok Granola Bars for all of you. Ewoks are the coolest, am I right? An these bars are just as cool as you can get. For any fun loving Star Wars fan, they're going to love these. And you'll love how super easy they are to make. Enjoy! Pull and flatten one Tootsie Roll until you have the shape of your ewok's head shroud. It's OK if looks lopsided. It should look really rough. Rip a hole in the tootsie roll shroud where your ewok's face will go. Place your ewok's tootsie roll shroud on the top of your granola bar, pinching it down on the sides to secure. Take the small piece of reserved tootsie roll candy that you ripped from the head shroud and make two round and thin ears. 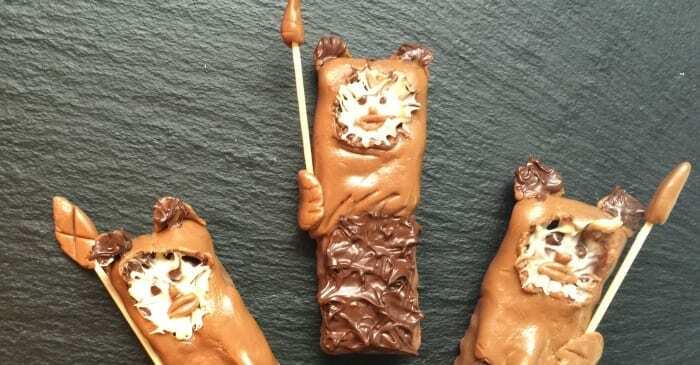 Attach the ewok's tootsie roll ears to the top corners of the granola bar. Take a second tootsie roll and pinch a small section to form your ewok's hand. Pinch off more candy to make the tip of your spear. Poke your toothpick into the bottom of the spear tip you just made. Affix the spear and the ewok's hand to the side of the granola bar. Form the fingers by indenting the candy with the edge of another toothpick. Pinch another section of tootsie roll off and form the lips and nose. These should be very small. Unwrap one chocolate kiss and place it in a small microwave safe bowl. Microwave on high for 15 seconds or until just melted enough to be stirred with the tip of a knife. You do not want the chocolate to be liquid. Spread the dark chocolate onto the bottom of your granola bar lifting up with your knife to form peaks resembling fur. Spread some more dark chocolate into the head shroud hole where the face will go. Place one square of white chocolate in a small microwave safe bowl. Microwave on high for 15 seconds or until just melted enough to be stirred with the tip of a knife. With the tip of your knife transfer a small amount of melted white chocolate onto the dark chocolate on your granola bar in the place where your ewok's face will be. Be sure to lift up and out with your knife to form peaks of fur. Using tweezers, place your ewok's nose and mouth onto the white chocolate. Dip a toothpick into your melted dark chocolate and dab two eyes onto your granola bar. Allow a few minutes to let your chocolate set before serving.